Backconnect proxies are working as a third party with your network they are connected with your internet connection and send the request on your behalf. This is the reason special backconnect proxy is getting famous in all over the world. Backconnect proxies are having the unique features which make them different from other proxies. We will talk about the types of proxies today which are using in the market and how backconnect proxies are better than them. There are various kinds of proxies which are used by internet users. They can select one of them according to their needs. We are mentioning few of them for you if you do not know about proxies. So you may be clear with your choice. These proxies are shared special backconnect proxy by different users at the same time. This is the reason these are very slow proxies. They keep connecting to the internet till their request didn’t furnish from the server side. On the other hand, these are very low cost and you can use them for your home to secure browsing of kids. These proxies work well if you do not have sensitive information which you do not want to share with anyone. Shared proxies sometimes become really harmful for the users because when you are online at the same time may be hackers are also using the same proxies. These proxies are used by the single user at a time. These proxies are very safe when you are browsing the internet. You are the single user of these proxies and your information is really secure when you are using private proxies. These are static proxies so if you want to create mesh you have to purchase more proxies. 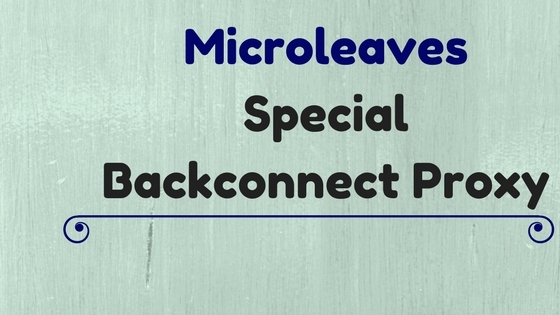 Private proxies by Microleaves are not expensive you can easily afford them. Some companies give you monthly plans for these proxies. Private proxies are used by companies who do not want to share their content with others. Dynamic proxies are the modern method to surf smartly over the internet without any fear. Special backconnect proxies are the dynamic proxies which connected to your internet connection and change IP address sometimes after a minute. This is the most special type of proxies which is giving its services in small and large business sectors. These are very secure as compare to other proxies because they are changing your identity in every minute sometimes. Backconnect proxies are very fast that has changed the concept of older and slower proxies. The special backconnect proxy provides you best internet solution to stay safe from the hackers and other spam software. However, the cost of the backconnect proxies is very high that no one can afford them easily. But large companies spend a lot of budgets on buying proxies because they do not want to compromise on their privacy. Backconnect proxies always come with packages due to a lot of IP addresses. Smaller companies may purchase smaller packages. These proxies are provided to you from the internet service providers so they are easy to setup. When you are connected to the internet you are using backconnect proxies. If any DDoS attack launch and you are using servers of backconnect proxies for your website. You are safe because there are a lot of servers having data of your websites. These servers are divided according to the region. If the original server stops responding to traffic special backconnect proxy server start responding on the behalf of your website server which will give you a huge advantage.